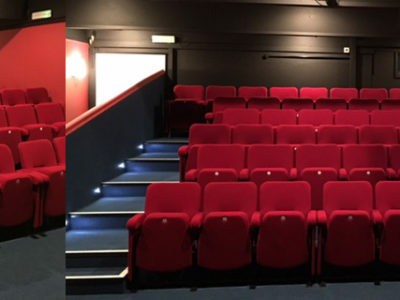 Whether you have a purpose built conference facility or hire out a room within your venue, there are a range of different seating layouts you can offer to your clients. 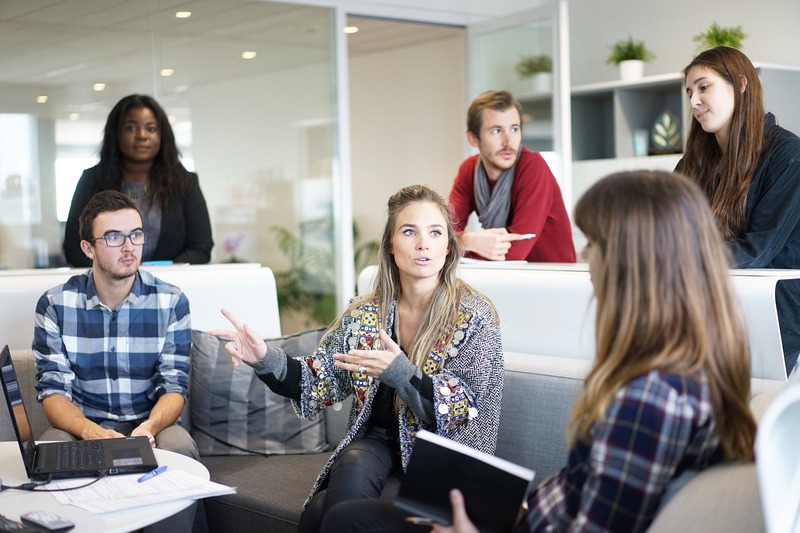 Here we take a look at the best conference seating layouts, the types of meeting each one works best for, and the situations where they may not be suitable. 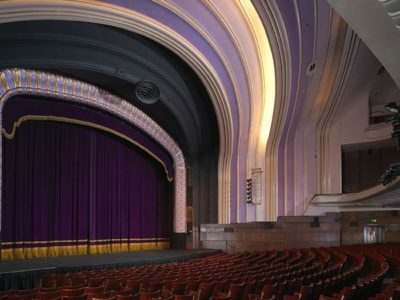 This is the most popular layout for conferences and training sessions where the audience is required to watch a presentation or listen to a key speaker as it directs everyone’s attention in the same direction. It’s also the easiest layout to configure and allows for maximum use of space. 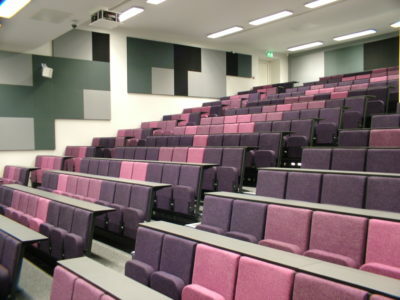 This layout can be used for fixed auditorium seating and also for individual chairs. 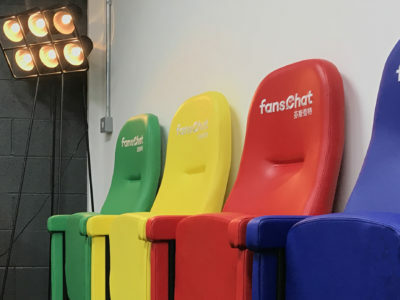 If your conference space is multi-purpose then permanently fixed seating may not be an option but there are many different styles of stacking chairs designed for conferencing with options such as fixed and folding writing tablets, eliminating the need for separate desks. 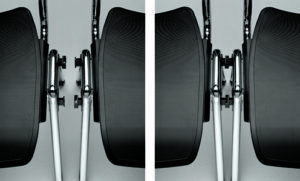 Many stacking chairs are supplied with linking brackets so you can ensure rows stay neat and people cannot move chairs around. 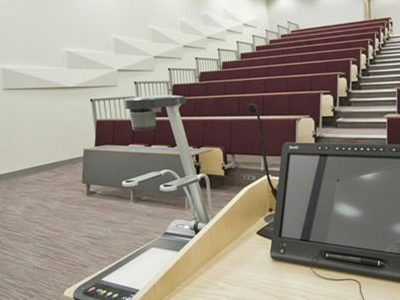 This layout is not the best option if the audience is required to interact with each other, although positioning the seats in curved rows can help with this. 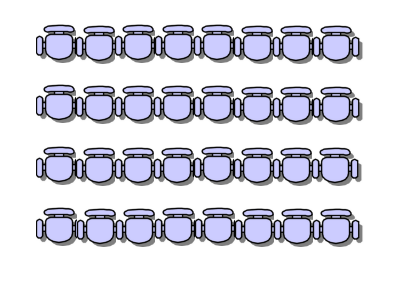 Also be aware that long rows of seats can cause inconvenience if people need to leave the room mid-conference – think about how many aisles you might want to incorporate to break up the rows and provide easier access in larger spaces. The traditional boardroom style features chairs positioned around a central table and is better for smaller meetings and conferences. 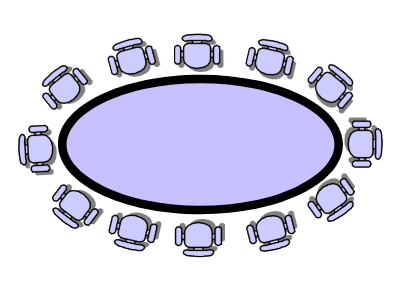 Oval tables are usually preferable where collaboration is required as this shape makes it easier for delegates to see each other properly. This isn’t the most comfortable layout for meetings where there is one key speaker or if a long presentation is to be given, however. If delegates have to twist to face a particular direction for a long period of time this can lead to discomfort which then leads to chair shuffling and distraction. 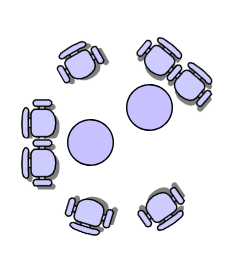 This layout better suits collaboration and interaction where various people around the table will be speaking throughout the meeting or conference. 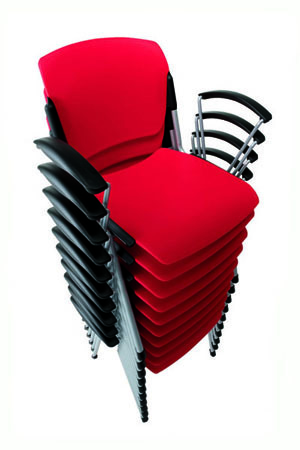 A range of different chairs could be used for this configuration from high spec boardroom chairs to basic stacking chairs. 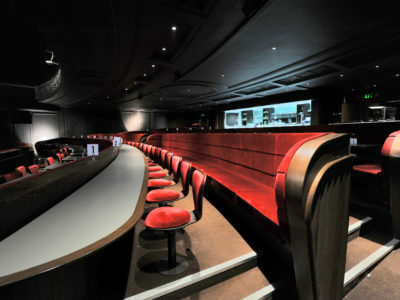 Similar to the boardroom style, the horseshoe layout has tables and seats around 3 sides with an open space in the middle which the presenter can walk into. For meetings which need to facilitate a speaker and collaboration among the audience, this layout is a good choice and works most effectively for smaller numbers. 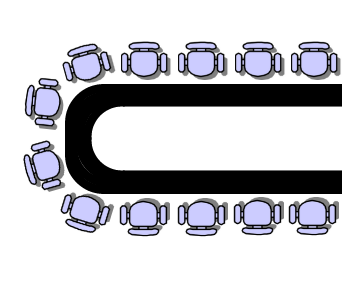 The U Shape can be widened with a longer table at the end to accommodate more people. 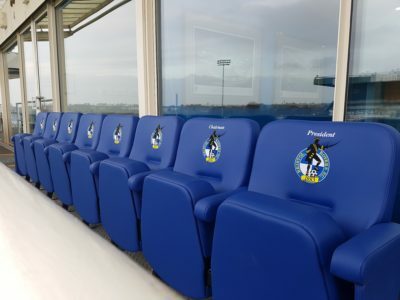 Again this layout suits a range of different seat types from boardroom chairs to stacking chairs. This style is ideal where collaboration among smaller groups is required. It’s also perfect for events where food and drinks will be on offer, particularly if a formal meal is served. This is not a good layout for training sessions or conferences involving lengthy teaching or instruction as half the room will need to significantly adjust their seat position to get an optimum view of the speaker. If you want a more relaxed layout, comfortable seats and low tables are good for collaboration and networking. This arrangement is much less formal and is ideal for meetings where a lot of discussion is required such as brainstorming sessions and planning meetings. 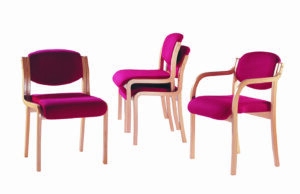 Using a combination of different seat types enhances the informal feel whilst seats can be moved around as necessary to accommodate the required number of people. 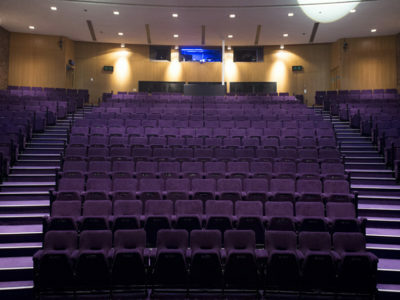 The ability to offer a range of different seating configurations will make your conference venue attractive to a wider audience. 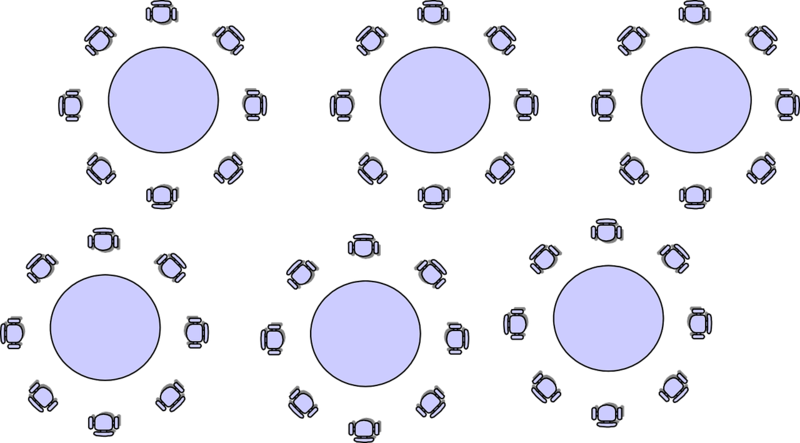 Show potential customers the different layout options available using simple diagrams like those above, or better still, actually create the different layouts in your conference space and photograph each one. 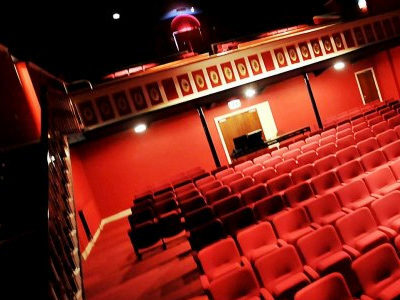 This will help them visualise how your venue can work for them and determine if it's suitable for their requirements. 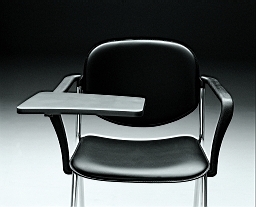 To make an enquiry about Evertaut conference seating, please complete and submit the short form below.